Here is another super simple way to inject some fun into your workplace. Stop jumping through hoops and start using them to your advantage. What a great idea, pop a few hoops in the office, they take up no room, they are cheap to buy and the benefits are endless…. 1. Counteract The Health Risks of Sitting Down For Long Periods of Time by Taking Small, Frequent Hoop Breaks! According to this WebMD article, even taking short breaks from sitting down can be good for your heart and your waist! So…take a hoop break to slim your waist! 2. Improve Your Concentration Researchers have found that brief diversions can vastly improve your focus. According to this New York Times article, “a growing body of evidence shows that taking regular breaks from mental tasks improves productivity and creativity — and that skipping breaks can lead to stress and exhaustion.” While some traditional options for short breaks include taking a walk, leaving the office for lunch or reading a book..why not grab your hoop and head to an empty conference room or to an empty space in your building’s parking lot? You will not only clear your head, you’ll come back to your desk feeling more focused! 3. Burn Calories…for Hours After You Hoop! Hooping has been proven to burn over 400 calories per hour by the American Council on Exercise, although the calorie-burn from hooping may be as high as 600 calories per hour when other parts of your body, such as your arms and legs, are engaged. To break this down even more, consider that, according to a 2009 AARP Bulletin, hooping it up for eight minutes gives you a good cardiovascular workout and will burn a whopping 50 calories, or a satisfying 6.25 calories per minute! And the ACE reported, according to a study they conducted, that hooping burns approximately 7 calories per minute! Burn, calories, burn! But beyond preemptively burning off your lunch, hooping can increase the amount of calories you burn for hours after you hoop. According to some sources, the secret to permanent weight loss is training your body to be a more efficient calorie-burning engine by maximizing your metabolism. And, studies show that you can continue to burn extra calories after you have finished your workout. 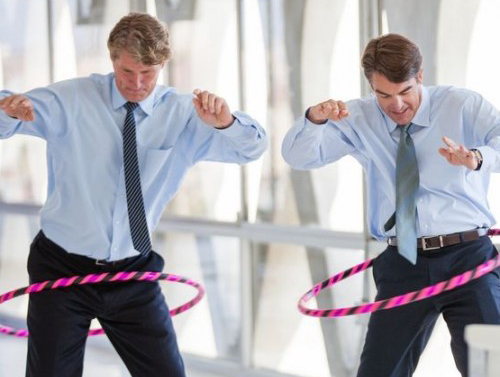 Hooping during work will enable you to experience this “afterburn” at your desk! 4. Improve Your Mood & Let Go of Stress & Frustration Besides the wonderful burst of endorphins you’re likely to enjoy after just a few minutes of hooping. Moving around after being sedentary for some time can help you work through work-related stress and frustration. After hooping we often feel like younger, stronger, more clear-headed, more confident versions of ourselves…in other words, we feel like better–if not our best Selves. Warning: Confidence, positive thinking, peppiness, and go-getterness may ensue…Taking out your hoop will not only allow you to spin your stress away, but can give you the inspiration, energy and refreshed perspective to come up with creative solutions to your work-related problems. 5. Connect More with Co-workers & Take the Lead in Inspiring Others According to an interview with Niki Leondakis, COO of Kimpton Hotels & Restaurants, hula hoops play a big role in building important leadership skills and cultivating an excellent rapport among coworkers: “One of the important aspects of working at Kimpton is having fun. For leaders, the ability to laugh at yourself is key, so we use Hula Hoops to demonstrate that…Every year at our annual meeting, we have a general-manager meeting. About 250 people, along with our corporate team, get together for a couple days. This has been a ritual for about 15 years now. Anyone who’s a first-timer, we call them up to the front of the room, and we play the music to “Wipe Out,” and we do this hoop-off. So five people at a time hoop and then there’s a winner. There are usually four to six new teams of people. The winner of all the newbies, as we call them, then has a hoop-off with last year’s reigning champion. ← Are you PLAYING to win?